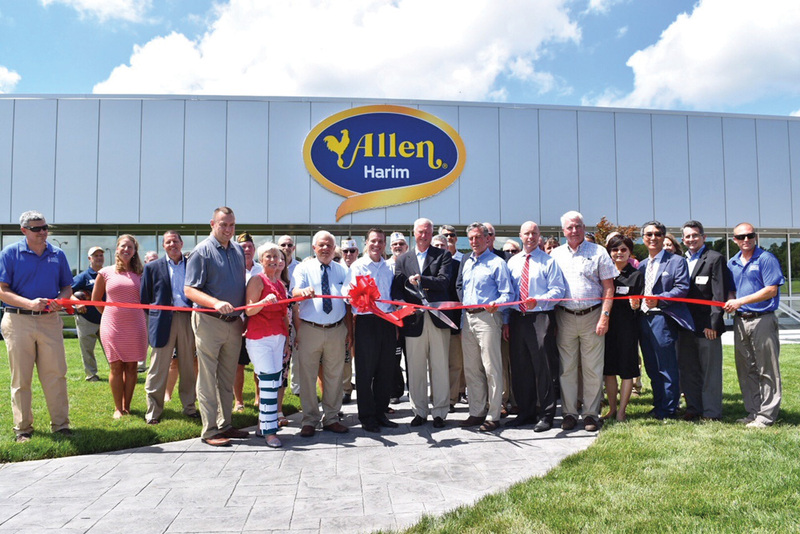 Allen Harim recently opened a headquarters in Millsboro on Thursday, Aug. 2. Allen Harim, a producer and processor of no-antibiotic chicken on Delmarva, has moved into a new corporate headquarters building near Millsboro, and Delaware Gov. John Carney was on hand Aug. 2 to help cut a ribbon at the new facility. The company, which will be celebrating 100 years in business next year, had been headquartered in Seaford since it was founded in 1919. At the ribbon-cutting on Aug. 2, elected officials and guests included state Sen. Gerald Hocker, state Sen. Brian Pettyjohn, state Rep. Ruth Briggs King and Sussex County Councilman Rob Artlett, among others. The new 18,900-square-foot headquarters is located in the former Vlasic pickle plant the company purchased in 2014. The renovation was completed by Delmarva Veteran Builders (DVB), a company based in Salisbury, Md., that hires primarily veterans. The new corporate headquarters employs about 50 people, from the executive team to accounting personnel and the sales team. The new address is 29984 Pinnacle Way, Millsboro. The 460,000-square-foot building also houses a consignment warehouse operation that stores boxes and other packaging materials from International Paper and other vendors that are used in the Allen Harim production process. Sussex County officials recently approved a deboning operation in a small part of the facility. The 50,000-square-foot space will employ 165 people who will be deboning chicken. All of the chicken will be processed in Harbeson and then brought to Millsboro by truck to the deboning plant. Once all the necessary permits are obtained, that work is expected to begin this fall. Allen Harim currently ships that chicken to be deboned to Georgia for further processing.